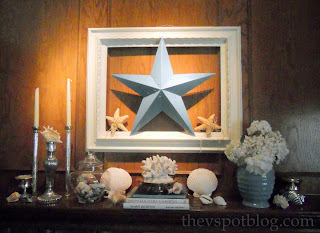 The one where I talk about terrorists, patriotism and decor in the same post. Weird. I love Fall. I think it may be my favorite time of year. I have been pinning Fall inspiration to an Autumn Pinterest board for months. I’m ready to bust out all of my Fall decor… and I’m feeling guilty. I think we have all recategorized our lives into Pre and Post 9/11. Pre-9/11, my summer decor came down the day after Labor Day… but in the Fall of 2001, I left it all up until Christmas-time. In large part because of the wave of post-9/11 patriotism, but also because I was still so stunned that I couldn’t even think about something so comparatively trivial as home decor. Ten years later, I am chomping at the bit to have Handsome Hubby to get my Fall boxes down from the rafters. But I wait. I still want to pack up all the summer stuff and put it away. But I don’t. 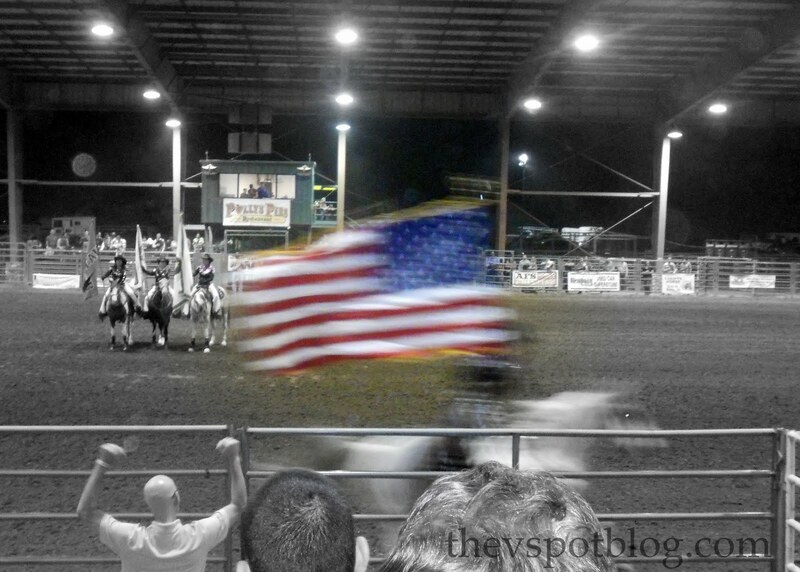 I leave the flags up and the red, white & blue sitting out. I put it away on September 12. Why do I only have flags or other “Americana” out during the summer time? Every year I watch the 9/11 documentaries and replayed news footage. Every year I still have my heart race, my eyes fill with tears and feel like throwing up. And every Fall I wonder why our flag isn’t out Every Day Of The Year. Am I the only one who feels like they have managed to reduce the symbol of patriotism and love of this country down to a part of their summer decor? Does anyone else feel a bit guilty when they take the red, white & blue down and box it up? 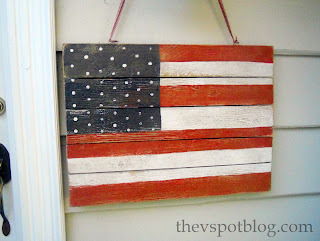 Anyone have any ideas on how to incorporate a little love of country into fall, winter and spring…? Hmm well I didn’t feel guilty until now! I think if we fly the flag outside throughout the year then that can help us remember and it is more than just decor then. I’m with Emmy, I had no guilt until now. If you come up with a way to turn Old Glory into something Fall please let me know! Interesting post! I loved when every house had their flags out after 9/11. I think Old Glory waving in the wind on a beautiful Fall day is a fabulous sight. Since we’ve got 9/11, Columbus Day and Veteran’s Day in the Fall, I see no reason why the flag can’t be a staple for the season. I still remember where I was when 9/11 happened. It will be forever etched in my brain. No matter how many times I refresh this page, I can NOT see the last picture after you say “and it got me thinking”. WHY INTERNET WHY? I really want to see! It’s not weird at all. I love that keeping everything up until Sept 12 is a perfect way to remember that fateful day. I try not to think to hard about life before 9/11 because it still makes me so angry how much things changed for us…My husband a 16yr airline mechanic for USA was now unemployed like 25k other airline workers nation wide…We watched as friends lost their homes and cars and children’s college funds…We barely got out before loosing ours…Moving to FL and renting a trailer cheap from family until we could get back on our feet…and here we are a decade later, still scratching to make the bills each month while hubby works for Walmart. I believe I shall put my Where I was on 9/11 story up. You inspired. I’ll wait til the 11th though. 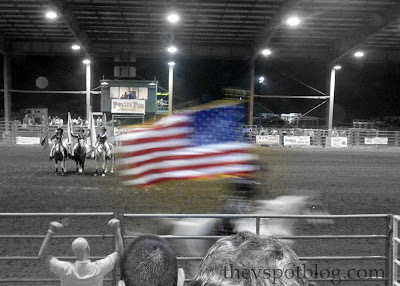 I went to a rodeo once. I gasped when they threw the little calf on the ground and everyone turned to look at the silly woman who did that! When my oldest son was 10 weeks old, we moved to a tiny little town in Michigan. One of my favorite things about living there was that so many houses proudly flew American flags. We bought an old Dutch Colonial which had a flag holder attached, so we promptly went downtown to the hardware store and bought a flag. We flew it every day. It looked glorious in all seasons. I think one of our problems may be that we’ve started thinking of the flag as decor instead of the powerful symbol it is. Here’s an idea: read all the verses to “The Star-Spangled Banner” (you can find them at http://www.usa-flag-site.org/song-lyrics/star-spangled-banner.shtml ). Thanks for making us think, Vivienne. Well…I dunno. I think we’re especially spoiled these days…even after 9/11 we can look at the flag as a piece of decor. And I’m saying that I DO TOO. I mean, I know it’s the flag. I know what it represents, but I also don’t want TONS of flag stuff around my house. I think it comes down to knowing what it stands for and FEELING what it stands for. After 9/11, we FELT it. Many of us (me probably most) for the first time. 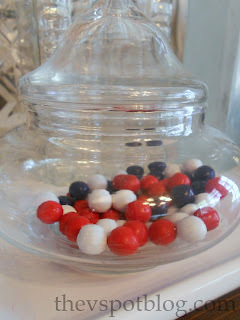 If you are doing an American Flag craft, you can always use warmer tones, of the red, white and blue. Like rusty red, cream, and dusty blue. Then I think it’ll blend better with the decor for those seasons. Wonderful post Viv. As a military family and as someone who’s husband works to prevent a 9/11 from ever happening again, our family does leave our very large American flag hanging outside all year long. We only pull it down in inclement weather as a sign of respect for Old Glory. 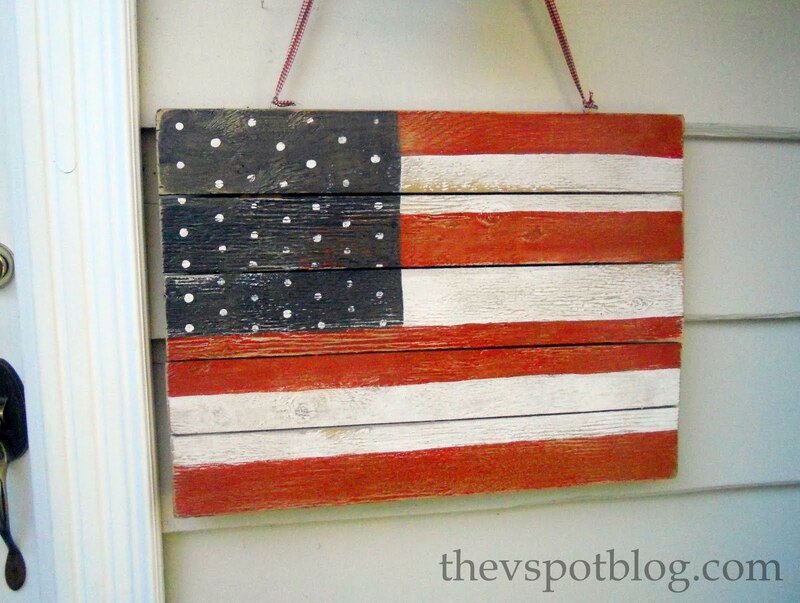 I believe the red, white and blue of our flag looks beautiful with any decor! I feel as you do. I get weepy and feel ill every time I watch footage from that horrible day. It’s like living it again. Sunday will be a very difficult but special day of remembering and contemplating. The motto of my husband’s agency is “Never Forget”…something we all should remember. About 10 years ago, I had a thing with the Americana look and my whole downstairs was decorated in Red white & blue – but not at all any more and I haven’t ever really thought about it until now. hmmm. Nice post Viv. Just tweeted it.